"A smart and characterful hotel in the top Austrian resort of Saalbach, the Sport Berger hotel is ideally located in the town centre, close to the lifts. The hotel is renowned for its welcoming, hospitable atmosphere and good food." Centrally located in the village’s pedestrian zone, the Berger’s Sporthotel is ideally located with a good choice of bars, restaurants and shops in the immediate vicinity. The Schattberg Xpress gondola is just 100m away, and the free ski bus stop 250m away, providing easy access to the slopes. 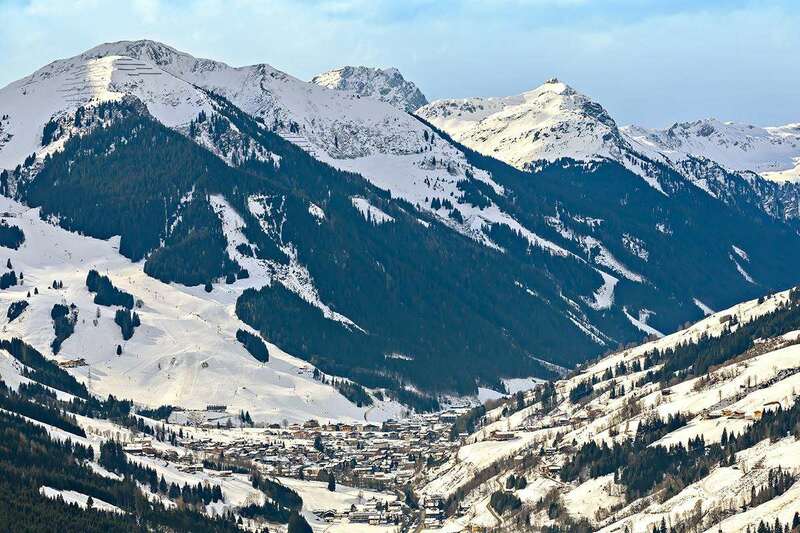 One of Saalbach’s long standing favourites on the high street, Berger’s is loved by many guests who return year aft er year for its laid–back atmosphere‚ good food and the personal attention that the Berger–Brandl family give to all their guests. Enjoyed by many also for its flamboyant décor, which includes an impressive circular galleried bar & restaurant and unique prosecco bar. The hotel hosts regular evening entertainment. 60 bedrooms: All are located in the main hotel building or in the Annexe 20m away. All rooms have flat-screen TV, mini bar, telephone, internet access, hair-dryer and safe, and are non-smocking. Smaller double rooms have a French double bed (1.5m x 2m), shower and wc and are good value. 3*+ Annexe Rooms (2-4 people): Austrian twin rooms with bath and wc, some which can take up to two extra beds, some with a balcony. All Annexe guests share facilities with the hotel. Four- course evening meal with choice of main and salad buffet. Weekly 'Farmer's Buffet' and Gala dinner. 3rd time in this hotel and 6th time to resort. Great location, Austrian in style and decor but perfectly functional and good choice of food. As with all hotels along the &quot;strip&quot; there is noise at night from apres party goers so a room to the rear is better. After spending a long while on the phone confirming exactly what rooms were required for our group, I was very annoyed to find when this was booked with the hotel all the information I had provided was disregarded. Not only were the room allocations not as booked and discussed but they were not even in line with common sense as we had a married couple who had been put in double rooms with other people! This took some time and disagreement to resolve with the hotel staff. Iglu were the agent and I could not fault the staff when we were away as I unfortunately injured myself on holiday and the staff were very helpful.